To minimize your chances of losing a tooth after a serious dental injury, you must take appropriate action. Let’s explore the steps you should take to treat a cracked, dislocated, or missing tooth. 1: Stay calm. Almost all dental injuries are treatable. It’s hard to stay calm after a serious dental injury. But modern emergency dentistry is capable of just about anything. Most dental injuries can be treated if the appropriate next steps are taken in time. Missing (Avulsed) Tooth – If your tooth has been knocked out of its socket (avulsed), it’s critical to find it as soon as possible. After you’ve found your tooth, rinse it off using warm water, and attempt to replace it in its socket. This will keep the tooth moist, and maximize the chances of it being reattached. If you’re unable to reinsert the tooth, keep it in a small plastic bag with a saline solution. Regardless of how you store the tooth, you must get to your emergency dentist as soon as you can, preferably within 12 hours of your injury. Cracked Or Chipped Tooth – Cracked teeth can be extremely painful if the nerve pulp of the tooth is exposed. To avoid further pain and damage, avoid chewing food and minimize drinking. Keep in mind that exposed nerve pulp can be extremely sensitive to hot and cold liquids. Use gauze or a sterile bandage to deal with bleeding, and get to a dentist as soon as you can. Cracked teeth can be repaired with crowns, dental bonding, and a number of other techniques, but treatment must be done as soon as possible to avoid the death of critical tissue. 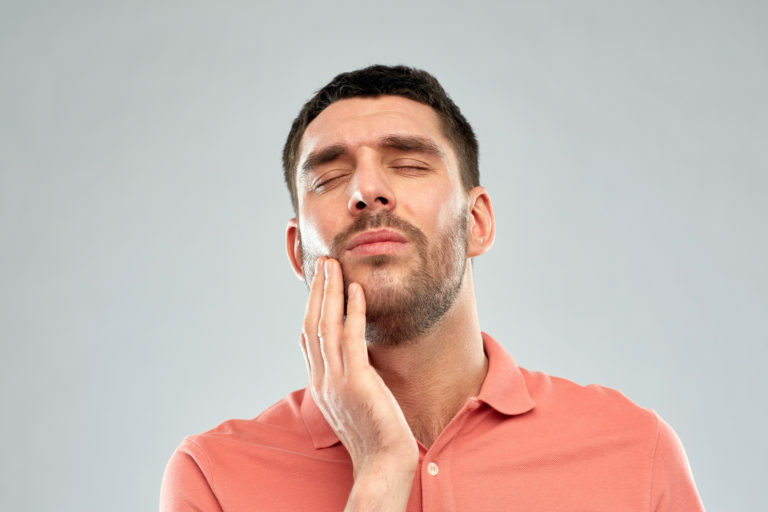 Loose Tooth / Tooth Intrusion – If you have a loose tooth, use a sterile bandage and apply gentle pressure to keep it in place and to help stop any bleeding. Tooth intrusion, when a tooth is driven back into the jawbone by extreme force, is rare. But when it happens, it causes serious discomfort and bleeding. In extreme cases, it may cause the death of gum and tooth tissue. If this happens, see an emergency dentist immediately, or go to the emergency room. 2: Dealing with the pain. Any dental injury is going to cause quite a bit of pain. Over-the-counter medication like ibuprofen and acetaminophen can be used to help reduce inflammation and mitigate pain until an emergency dentist can be seen. Using ice can also be helpful for injuries that involve soft tissue damage. But, steer clear of any topical numbing agents. Numbing the area could cause further damage during a time when you need to be very gentle with your mouth. 3: See your emergency dentist as soon as possible. We’ve said it before and we’ll say it again. No matter what the severity of your dental injury is, it’s important to see a dentist as soon as possible. Ideally, you should try to see an emergency dentist within 12 hours of your injury. Failing to do so can lead to serious dental complications, such as dry sockets, dead gum and tooth tissue, and many other problems. Don’t delay! Dr. Naik of Priti Naik, DDS, a Vienna family dentist, offers flexible hours, same-day appointments, and comforting patient care. Her and her team are a group of experienced professionals who understand urgent care and the best treatment options for any dental injury. If you’re in the Vienna, Mclean, or Tyson’s Corner area and suffer a dental injury, call (703) 288-1800 or visit our office at 8230 Boone Blvd #320, Vienna, VA 22182. Get the care you need and get back to your life!